Bengt and Mikaela with family welcomes you to visit Rejböle Gård in Karis. Situated only an hour from Helsinki, Rejböle is an old outlaying farm to Fagervik manor, with history dating back to 17th century. 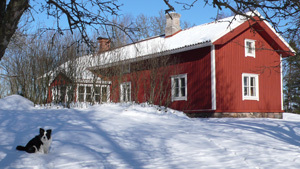 Today Rejböle Gård is a small family run farm with cultivated lands, pastures and forest by lake Marsjö. 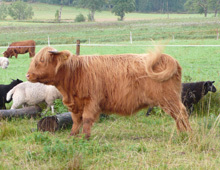 The pastures are grazed by sheep and Highland Cattle. We also have dogs, cats, rabbits, hens and a goat. We are carefully restoring the old buildings on the farm one-by-one and some of them are now used for accommodation purposes. Relaxing farm surrounding offers the ultimate escape for shorter or longer stays. Let our passion for natural materials inspire you. Visit our Country Shop at the farm or our online store (unfortunately only in Finnish and Swedish yet), where you find a selection of our developing assortment of high quality products made from linen, sheepskin and wool. We supply to both retail and trade customers. Feel free to contact us for more information.